In the year HOLTOP marks its 25th anniversary, the Trust is thrilled to have an opportunity to thoroughly review the landscape in which it works. A strategic plan will be developed based on the results of an independent review, which will assess the factors influencing the Trust’s work; identifying opportunities and challenges, while also assessing governance arrangements, and financial sustainability. As an established Building Preservation Trust, led by a professional Project Organiser, the project also aims to share the Trust’s experience of rescuing, and converting ‘Heritage at Risk’ buildings with a wider audience. A series of 5 informal workshops will be run for volunteers involved with the rescue of important community buildings. Topics will focus on early stage project work, and include: commissioning an Options Appraisal; interviewing a professional team; securing funds from private sources; asset transfer and partnerships. An Options Appraisal delivered on behalf of Ealing Council, and funded by the NLHF, the AHF, and Ealing Council, will be led by Butler Hegarty Associates, to establish a new use for the Grade II listed chapels at South Ealing Cemetery. A day seminar during which our experience of delivering the Resilient Heritage project will be shared will close the project. 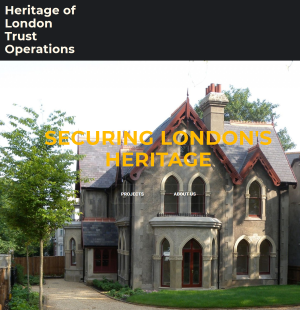 The Heritage of London Trust Operations Ltd is a London wide building preservation trust, founded in 1993, to find solutions for heritage at risk on Historic England’s register.